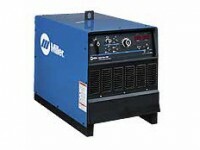 The Miller Gold Star 452 Built-in arc control for Stick welding allows operators more flexibility when welding in tight areas where sticking electrodes is a problem. Hot Start™ makes it easy to start difficult electrodes. Simple control panel provides easy, efficient operation. Unique Fan-On-Demand™ operates only when needed reducing noise, power consumption, and the amount of airborne contaminants pulled through the machine. Enclosed circuit board provides additional protection by eliminating contaminants which cause premature failure of components.